Using an espresso machine is a technique that can be rather unforgiving. Lever-operated machines have the steepest learning curve, which is why automatic machines may seem like a no-brainer. But, the truth is that the latter not allow you to take full control of the brewing process. For better or worse, making a perfect cup of espresso can never be as simple as pressing the button and letting the machine do everything. Lever-based maker allows for more customization and gives you that wonderful hands-on-craft feeling. All you need to do is find a perfect maker and get familiar with it. The decision is not so straightforward though, so do not rush it. Take a look at our holy trinity of lever-style espresso making. 1 What is the Best Lever Espresso Machine in 2018? 2.1.3 Who should go for this one? 2.1.4 Where to Buy the ROK Presso Manual Espresso Maker? 2.2.3 Who should go for this one? 2.2.4 Where to Buy La Pavoni Europiccola? 2.3.3 Who should go for this one? 2.3.4 Where to Buy the Microcasa a Leva? 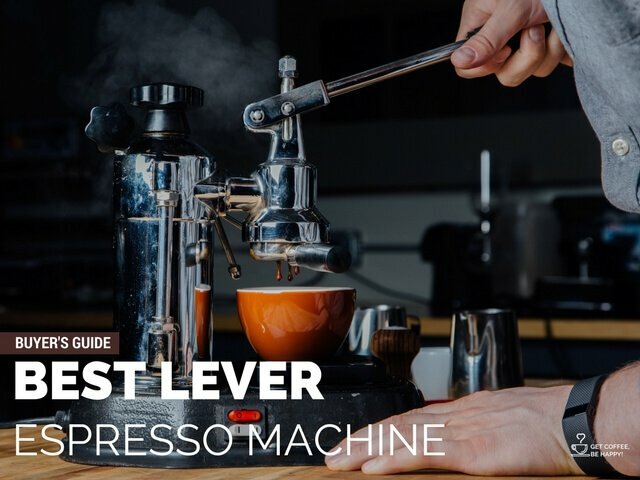 4.1 Did you like my Best Lever Espresso Machines Guide? What is the Best Lever Espresso Machine in 2018? Every once in a blue moon, in the realm of coffee making, an extraordinary event takes place. Such a thing happened when the ROK Presso Manual Maker saw the light of the day. Right at the first glance, it is obvious that Presso is a unique product. It is a bit more austere compared to other makers in the market, as well as the ones presented on our list. The looks can be deceiving, though. This machine was designed with prime functionality in mind. It has no frill and it weighs only 4 pounds, which implies it is easy to carry around. What is more, it is quite durable as well. A sturdy metal build and polished frame come with a 10-year warranty. You could say it is apocalypse-proof. Furthermore, one can operate it without any electricity. Users just need to follow the straightforward technique of pushing down and building pressure. Four rubber, slip-resistant legs located in the base allow it to firmly stand in place. This prevents the annoying sliding. The simple mechanism behind brewing as well as two levers located on the side of the machine enables the user to exercise control every step of the way. And since the ground coffee is used for brewing purposes, you are not forced to use a capsule or pod system. Considering this simple build, it does not come as a surprise that maintaining this machine is a walk in the park. I must admit, however, that in a way, its unparalleled simplicity is also one of the potential weaknesses. Namely, Presso Manual Maker is not the most worthy candidate to rival high-end models in terms of taste. There is no intricate heating system in place that maintains a consistent temperature. This, however, is not to say that it creates a bad brew. The key to maximizing the power of Presso is to use the right beans. Besides, there is still a plenty of reasons to pick this machine. If you are still not convinced, let’s just mention that the buyers also get a modern, reusable tin for storage, manual milk frother, scoop/tamper, splitter spout, and 49mm-portafilter. Here are some things to consider in case that Presso seems like your cup of tea, I mean coffee. Who should go for this one? Travelers will be over the moon because of Presso’s amazing portability. The same goes for those who spend their time outside, with no electricity around. Likewise, traditionalists and espresso enthusiasts may find the greatest joy in using this outstanding maker. 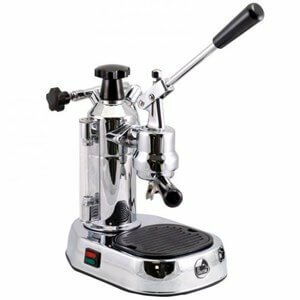 Where to Buy the ROK Presso Manual Espresso Maker? The Pavoni name usually rings a bell, even in the presence of newcomers to the savory world of coffee. The tradition continues with the Europiccola, a small cousin of the Professional and Romantica models. Weighing 14 pounds, it is more suited for home use. One of the strong suits of this maker is the quality of materials. The retro looks are great and one can almost feel the irresistible charm of the bygone. But, more importantly, this maker it has a triple-chrome base, brass boiler, and stainless steel heating elements. The construction oozes sturdiness all around. Now, note that Europiccola does not mount a spring lever, but a piston, which is operated by a user. This means you are placed in the driver’s seat during the whole brewing process. Of course, such control may not be to the liking of novices. 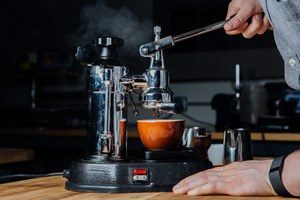 In any regard, there are a water level gauge and a safety valve as well as an in-built, traditional steam wand, easily one of the best features about La Pavoni’s little machine. Even without in-depth knowledge, you can use it to create thick and rich foam. One of the things I really like about this product is that the internal thermostats monitor pressure with re-set fuses. Also, the brass boiler performs incredibly well in terms of preserving heat and maintaining it even. Europiccola is capable of making 8, 2-oz. cups of espresso at a time. The taste is amazing with each and every pull of the lever. Oh, and you can also choose between using ground coffee or pod. In the latter case, you have to stick to the single shot filter basket. Another piece of good news is that cleanup is easy, mostly thanks to the presence of a removable drip tray. The water tank is removable as well and holds up to 20 oz. The solutions of water and baking soda or water and vinegar are recommended for effective cleaning and flushing. Finally, Europiccola comes with a screen, screen holder, tamper, measuring ladle, and cappuccino attachment. There is also an instruction video included, that will help you kick off your espresso making exploits. Just do not be surprised if you notice some watermarks, fingerprints, or other marks because this machine is tested in factory settings. 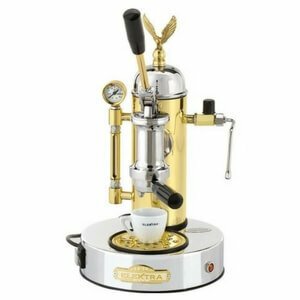 A sturdy, Italian-made coffee paragon, Europiccola is a no-brainer for coffee aficionados who like to craft their own, personalized espressos. After all, you are the one calling the shots from start to finish. It is also excellent for making specialty coffee drinks, a great addition to any kitchen and perfect for everyday use. 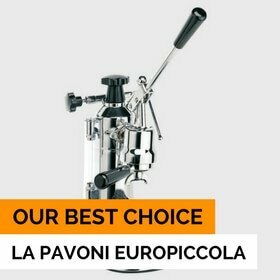 Where to Buy La Pavoni Europiccola? Microcasa is one of the most traditional models that Elektra has created to this date, a striking machine that echoes the pioneering, golden era of Italian espresso. It resembles a work of art rather than a mundane home appliance. And just like classic espresso machines, Microcasa uses a spring-loaded piston that presses the water through the coffee. The pressurized brew process delivers on its promise of bringing delicious, concentrated coffee to reality. The extraction starts at 8 bars and gradually declines in order to produce nothing short of a pristine, layered coffee. The spring on the machine is quite powerful, albeit some people may have to use both hands in order to get things done. It’s a great analog experience, but one that takes practice to get used to. The only real complaint I have is that the portafilter handle locks towards steam wand, which is somewhat awkward. Also, it should be noted that the maximum pressure is based on the power that the spring generates. The boiler is large enough to brew nine double shots. It is factory set for medium roast levels. The temperature can be adjusted as well, so that it matches desired roast levels. It is even possible to tweak it during brewing without messing with the pressure, using simple barista techniques. There is a sight glass as well as a steam pressure gauge that helps you discern exactly what is happening in the machine. In addition, a safety switch on the bottom of the boiler helps you steer clear of overheating problems. Those who are concerned about hazards should know that their suspicions are grounded: Boiler, steam wand, and brew group are exposed, which means users should keep the maker out of the children’s reach. The maintenance is easy and near worry-free and the parts simple to remove, although users should bear in mind that some finishes are prone to tarnishing (nicks and scrapes). At last, remember that to use the machine to maximum potential, you may have to invest in the high-quality burr grinder. Additional features and controls make this maker an excellent option for crafty aficionados. Once you come to know Microcasa, you can become a smooth operator and have a pleasant daily routine with it. I would even say that it will likely to pull off some of the best coffee you will ever taste. Where to Buy the Microcasa a Leva? Lever coffee machines are being rediscovered by many coffee lovers and for good reasons too. They give the power and control back to the user, letting the machine handle only what we humans cannot. So, you have a chance to turn espresso making into an utterly rewarding experience and tweak every tiny detail if you wish it so. Make no mistake: Every machine featured on the list is an excellent choice for coffee addicts. For us, however, Europiccola deserves the place in the dazzling limelight. 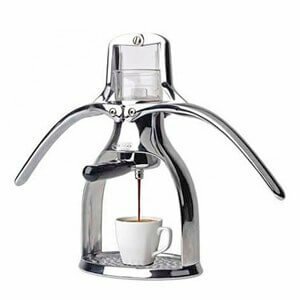 It produces consistent espresso shots, has superior features, and you get incredible value for a reasonable price. Nevertheless, always assess how difficult the machine is to use and how’s the quality of coffee it produces. Develop a deep understanding of the brewing process and enjoy a top-quality brew at home. Treat yourself with a machine that enables you to fully appreciate and enjoy the craft of coffee brewing. Lever Coffee Machines are being rediscovered by many coffee lovers and for good reasons too. Choose any from our list of Best Lever Espresso Machines! 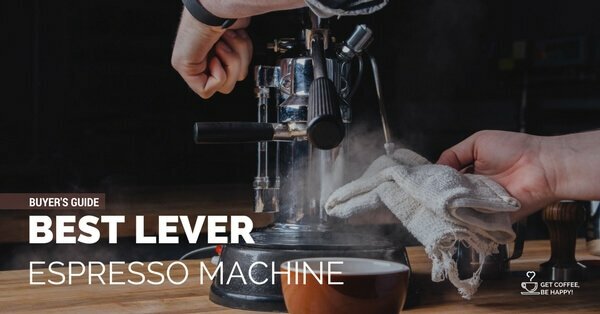 Did you like my Best Lever Espresso Machines Guide?